Allow students to practice small-scale rapid isolation of plasmid DNA, which is a routine procedure used for screening and analysis of recombinant DNA in cloning and subcloning experiments. In this experiment, students isolate plasmid DNA in just 60 minutes, without the use of toxic chemicals such as phenol or chloroform. 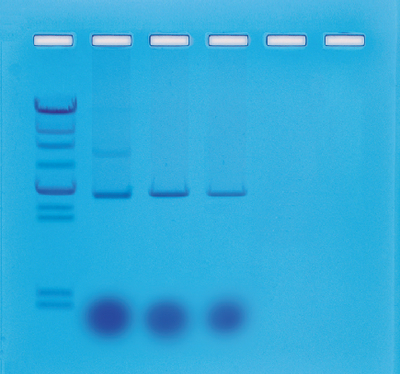 Material provided can support up to 40 isolations and five DNA agarose gels. Kit includes instructions, Plasmid Extraction LyphoCells, gel loading solution, UltraSpec-Agarose powder, electrophoresis buffer, InstaStain FlashBlue and FlashBlue Plus stain, calibrated pipet, 100 ml graduated cylinder and microtipped transfer pipettes.An electrophoresis tank, power supply, variable micropipet and tips, balance and microwave or hot plate are required and available seperately. Time requirements: 60 min. isolation of plasmid; 45 min. electrophoresis.